Last week, Edna, Erik, Rae and I went to the SeaWorld Adventure Park while in San Diego. I hadn’t been to SeaWorld in years since I was a kid. 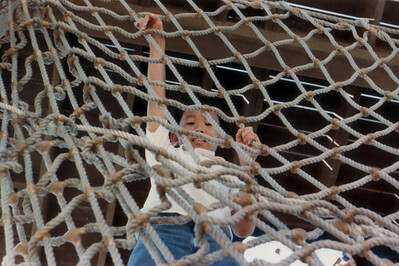 I have fond memories and photographs of me playing in Captain Kid’s World, which in the ensuing years has been renamed as Shamu’s Happy Harbor. Several attractions were closed last week, including the Skytower, Penguin Encounter, and the Seal and Sea Lion Feeder Pool. There were a ton of people at the park, with lots of parents, kids, and strollers. When they leave their strollers outside of the stadiums, what’s to stop someone from strolling away with their strollers? Attractions and exhibits that we saw included Wild Arctic (Polar Bears and Walruses), Manatee Rescue, Shark Encounter, Forbidden Reef, Aquarium de la Mer, World of the Sea Aquarium, Believe Shamu Show, Dolphin Discovery, and Clyde and Seamore’s Holiday Show (Sea Otter and Sea Lion). In addition, we attended an impromptu insect and lizard show, which was one of the highlights of our day. It was fun touching the Madagascar Hissing Cockroach (I would never touch the roaches in my garage! ), the fat-tailed gecko, and the lizard snake creature. We found the shows to be really short, only twenty minutes long. For some reason, I always remembered them being much longer. Maybe as a kid, time felt longer than it does today. 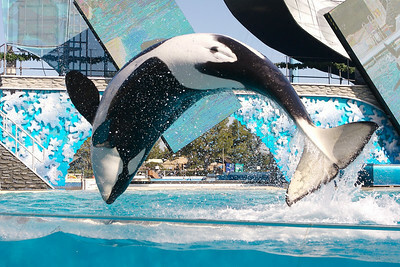 It’s possible that the Shamu Show was shorter due to the trainer accident that occurred a few weeks ago. The trainers did not stand on top of Shamu during our show. At the Shamu Show, we had the (un)fortunate opportunity to sit in the front three rows. The first dozen rows are humorously referred to as the Soak Zone. As you might imagine, one of the attractions at SeaWorld is getting showered by all of the various aquatic animals. The Shamu Slam included four killer whales slamming their tails into the water, forcing a veritable wall of cold, 55 degree water into the crowd. My camera, with its weather seals, survived the downpour, but we did not. Edna, Erik, and Rae seemed to have gotten the brunt of the water. I wore synthetics, which were able to dry out much more quickly than the cotton clothes Edna and Erik were wearing. I can only imagine what it’s like to swim with these marine creatures out in the open sea. One day, Eric, I’ll learn scuba diving and join you on one of your trips! Until then, I’ll enjoy them on your website and from the land! Great pictures! The killer whale jumping out of the water is awesome!